As most of you already know, I am a Mediterranean gal living in a Northern country. In order to preserve my sanity, I try to make sure that our little family lives in houses with a south orientation, to get as much sun as possible. Even though N. is much more flexible, he tries to accommodate my request. We recently moved to Haarlem (which is amazing, but more on that in a future post) and we do have a house with a south-facing balcony and plenty of light in general. 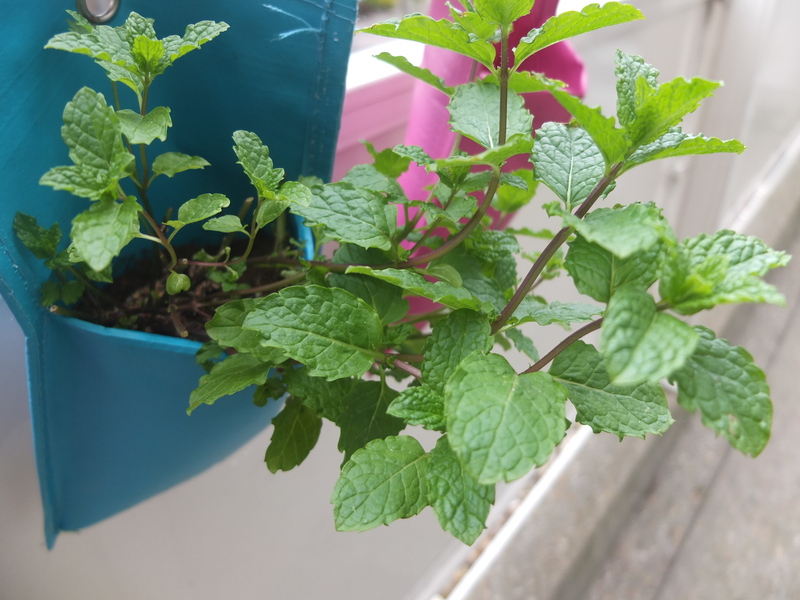 This has given me courage to try (once gain) to grow my own herbs. 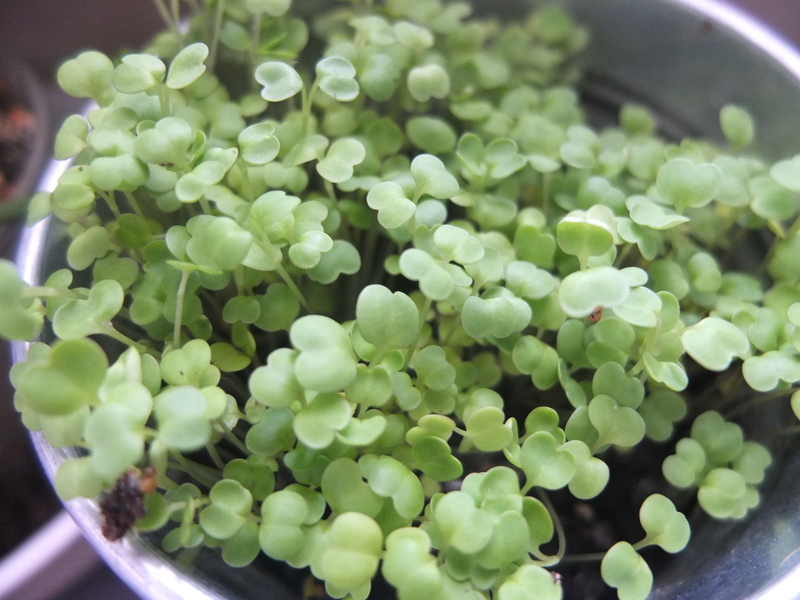 In order not to get too discouraged, in case none of my seeds would sprout, I decided to also purchase little plants and try to keep them growing. 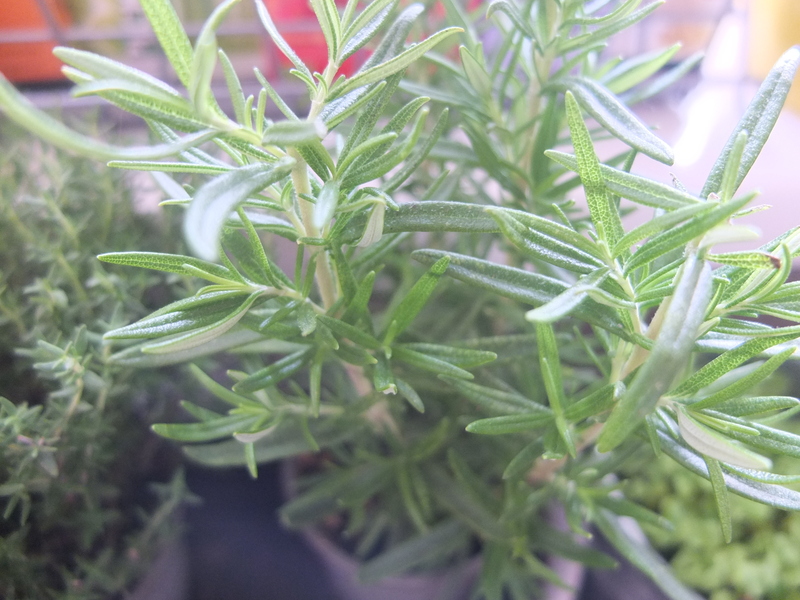 The thyme and rosemary in the pics are my brave soldiers, fighting to survive and expand their territory, while soaking up all the sun that comes through our kitchen window. It is a good idea to buy a few pots with organic herbs and plant them in a long planter that will rest on your windowsill. You can cut part of the herbs and use it in your cooking and the herb will keep growing. Just make sure to cut a 10% or less each time, to give the plant time to grow. 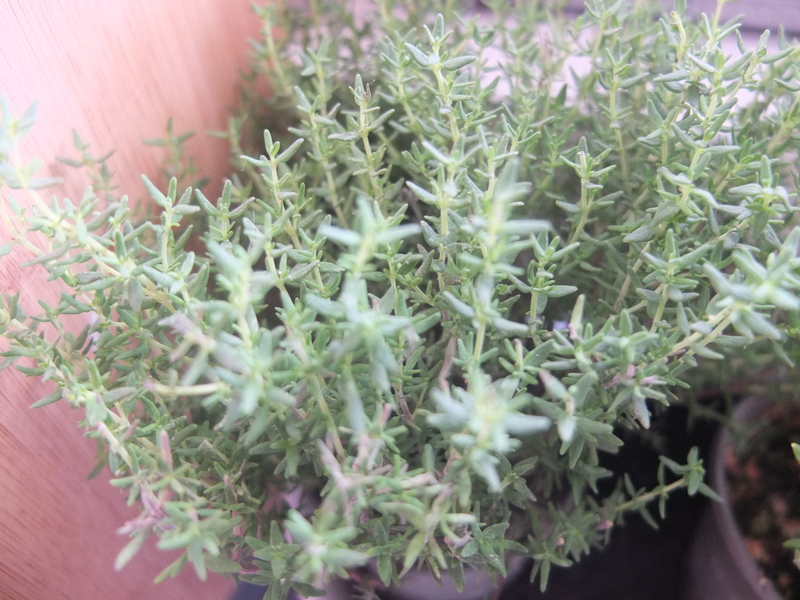 Rosemary and thyme need little water so I planted them together, while I planted some peppermint -that needs more water and can tolerate some cold- in hanging grow bags, that hang on the balcony rail. Unfortunately -thanks to Loulou- we don’t get to have planters on our balcony, as she loves to scoop up the dirt and either eat it or spread it on her clothes (some times both). So hanging bags it is. Both me and Loulou are crazy about cherry tomatoes and N. is quite fond of them too, so I decided to plant some tomato seeds as well and see what would happen. 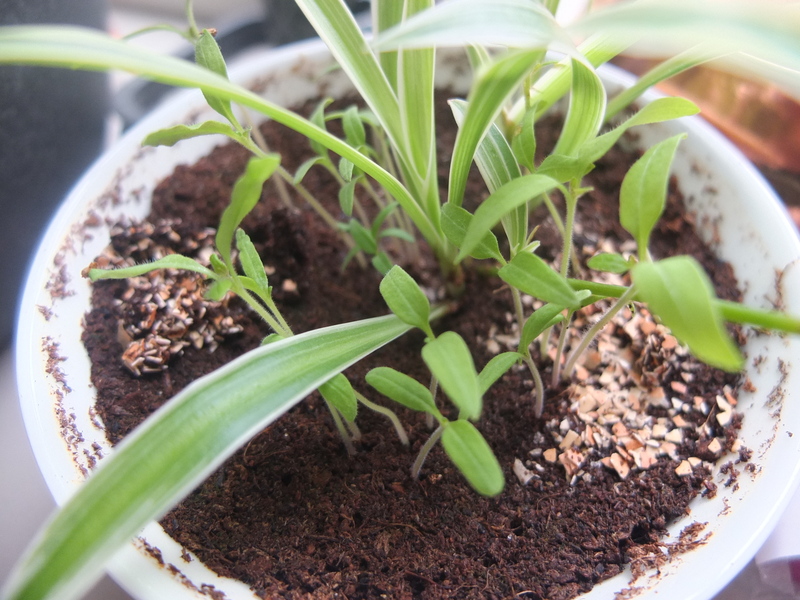 To my surprise they did actually sprout and they grow steadily. Here you see one of our cherry-tomato plants that cohabitates with a spider plant. I have also planted some rocket that took ages to sprout but finally I see it coming through the ground. I have probably planted waaay too many seeds in each pot, but honestly I never thought anything would actually grow! -Talking to your plants does actually help them grow. It has something to do with exhalation of carbon dioxide or something like that. If you are skeptical, keep in mind that if you spend some time talking to your green friends, you are more likely to spot plant diseases or pests early on and do something about it before it’s too late. -Keep egg shells, grind them and sprinkle them on your plants. This gives them a much needed calcium boost. You can also keep the eggshells in a container filled with water, let them soak for several days and use the water to water your plants. -Ground up coffee beans (aka what is left in your coffee filter or espresso machine after you enjoy your cup o’ joe) are a great fertilizer for your plants as they are rich in nitrogen. Tomato plants especially love coffee! -Cutting the top part of basil plants and other herbs as well helps them grow stronger. -Get organic seeds or plants, because if you wanted to ingest a ton of pesticides, why not just buy the pre-packaged grocery store herbs? Also, make sure to get an organic fertilizer, so that you won’t sabotage your own efforts. Have you ever tried to grow anything in an apartment? Did it work out? I would love to hear all about it in the comments.